Comments: Annual cub scout pinewood derby is a racing event for model cars made by scouts. This year we are including a medal for "Best Star Wars" themed car. We would love to have some members attend for photos and if desired, provide "security" for our new pinewood derby tracks during the races. Event is held in the gym and we typically have over 150 guests. We may discuss further details about a secure changing/staging area as there are some options at the facility. Having learned today your policy on donations for appearances I believe we will collect donations/ donate all concession sales from the event to the Richmond Children's Hospital at VCU Medical Center. Referred by: Attended the 2017 Blast Day event for Heart of Virginia Council Cub Scouts and picked up a business card for Garrison Tyranus. 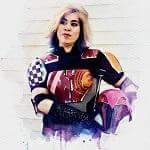 I will be there as Sabine! Count me in!